How do different Heart Warriors feel about their scars? Do people's feelings about their scars change over time? What's the best thing that anyone ever said about a Heart Warrior's scars? 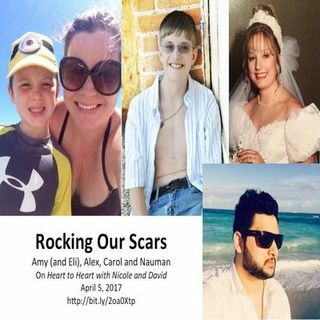 Tune in to this episode of Heart to Heart with Nicole and David to listen to Guest Hosts Carol Raimondi and Nauman Shahid interview fellow Heart Warriors Alex Jaworski and Amy Erb about how they rock their scars. I'm so glad you liked it, Amy! You were a terrific Guest! Thank you!